Have You Heard About Dri-Pak Soap Flakes? Dri-Pak, the only maker of Soap Flakes in England, and one of the few in the world, makes a centuries old, simple and effective laundry and cleaning product called Soap Flakes. Now available in the USA. Shaped like tiny flat diamonds, Soap Flakes are made from a 100% vegetable base of palm and coconut oils. They contain no additives. No bleaches, no phosphates, no enzymes, no harsh chemicals. Soap Flakes are so simple, they don't even contain any perfume - ideal for those with sensitive skin. Soap Flakes are perfect for washing delicate fabrics, silks, woolens and specially treated micro-fiber fabrics such as waterproof sports and outdoor clothing. Soap Flakes have not been tested on animals and are completely biodegradable. Other uses for Soap Flakes include home-manufacturing of soap, particularly by people who do not want bleaches, phosphates, enzymes or perfume in their household soap. Crafters buy Soap Flakes for their craft projects, or to use as a base material to create soap sculptures. In Scandinavia, Soap Flakes are used for washing down wood floors and they have also been used in many countries for the preparation of show horses and dogs--it leaves coats looking naturally clean and shiny. Until 2002, Dri-Pak also made the popular Lux brand of Soap Flakes. Now that Unilever has withdrawn the Lux Flakes brand from the market, Dri-Pak Soap Flakes are the best way to care for your delicates. For soap making and sculpting, add just enough warm water to make the flakes bind together in a pliable moldable piece. Do not ingest. In case of ingestion, seek medical advice. PLEASE NOTE: Garments with flame-resistant finishes may have their effectiveness impaired by using Soap Flakes. Always refer to the garment manufacturer's instructions. What is the best way to dissolve Soap Flakes in my washing machine? Very few people use Soap Flakes to clean "everything", although they probably could! Some people use Soap Flakes with water to wash floors, walls, and for cleaning carpet spots in addition to laundry use. People have told us they use Soap Flakes for washing dishes by hand, or as a shampoo, or to soften their bath water. We've had industrial companies buy Soap Flakes to use them as a lubricant when drawing wire through dies and we've had inquires about using Soap Flakes as a compound to reduce hydrogen bonding in adhesive making. People buy Soap Flakes to wash chickens, sheep, horses, dogs, boats, cars, to maintain their soap finished furniture, to polish rocks, and for a variety of craft projects. We are always amazed at all the uses there are for Soap Flakes. 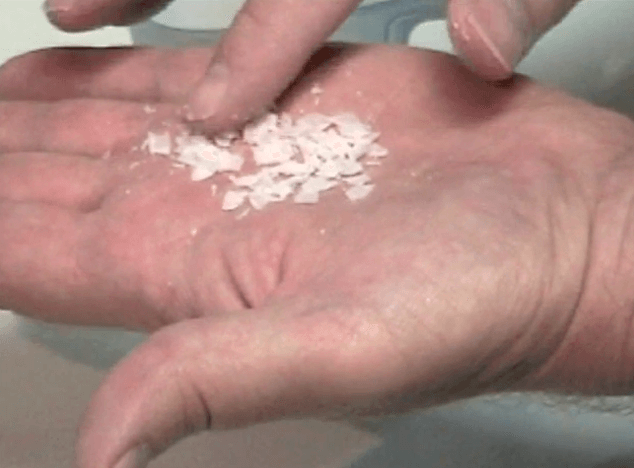 Rather than anything miraculous, Soap Flakes are simply pure soap. And pure soap has become quite unique due to its apparent rarity in the US marketplace. Want to use Soap Flakes in a simple craft project? Soap Flakes will bind together to make forms and shapes and can be sculpted. Just add a tiny amount of water and squeeze. Making little shaped soaps or bar soaps from Soap Flakes is pretty easy. The soap dries and becomes very hard in 3-5 days. Watch the instructional video below and see how to do it. Dri-Pak Soap Flakes are available in 1 lb. bags. Wholesale packs are sold by the carton. One carton contains 12 bags. Pallet loads also available. Bulk size (19.84 lb. bag) currently is in stock. MSO sells and ships online to USA addresses only. Canadian and other international shoppers please contact us for an order form or price quote. Might you be interested in a liquid version of Soap Flakes? Or some Soda Crystals?